Graduates will soon be flocking to Careers Expos around the country as the Universities and Industry Associations click into gear. Careers Expos can attract anywhere from a few hundred attendees to tens of thousands. Having been an Exhibitor at the 2012 Engineers Australia Careers Expo (where approximately 10,000 entrants participated) I found there are two main types of people that attend these expos. The first group just want to come and see. They are mainly between Year 10-11 at High School to 2nd year University. In essence they don’t know if they want to go to that university or what career they are after. They are just looking. These groups will go home with a show bag of goodies, the vast majority of which will be chucked. The second group are those who genuinely want to launch their career; they want to put their best foot forward and stand out to a prospective employer. Arrive early or late – the quietest times are at the very start or end of an expo. While it appears there are throngs of people waiting at the door – aka the Myer Stocktake Sales – once the crowd dissipates in the venue it is not that bad. In addition to the initial crowds are the extras that keep coming through the door 1-3 hours after the expo has started. Peak time in expo world is between the 2-4 hour mark (depending on how long it goes for). The last hour is much quieter. While exhibitors may be near exhaustion – you may be able to get more “air-time” than at other parts of the day. Have your resume on you. Harvest Human Resources Resume Writing Services can help you here. While many exhibitors don’t want your resume on the day there will be those that do. Have it ready to be passed over (keep to 1-3 pages) or an executive summary (summarised version of resume) either in hardcopy or on a thumbdrive. Be specific. 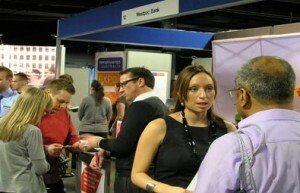 If there are hundreds of exhibitors – study them before you go and narrow it down to your top 20. Always have another 10-20 that would be interesting if you have more time. It’s like going to the supermarket without a shopping list. If you don’t know what you are there for you will walk away with something you don’t necessarily need nor want. Try and find someone that does the role you are most interested in (even if you have to wait). Here is the gig. You go to an exhibitor, they give you a brochure, business card, some pretty merchandise and a link to their website to apply on line. They won’t remember you and you more than likely won’t remember them. So big tip. Speak to someone that you can start to form a “relationship” with. Someone that could be your “in-industry” mentor. The great people to talk to are either really experienced as they can give you the whole pathway of how they got to where they are. Alternatively, find someone that is you 3-5 years from now. They will be the ones that were at the Careers Expo’s a few years back so know what you are going through. Get to speak to that person, get their business card (their personal one, not the company one) and after chatting about their experience ask permission to follow up with them after the event. Keep moving. There are many people that will be wanting to talk to the exhibitors so don’t push to have 30 minutes of their time or you will be remembered for the wrong reasons. You too should have an agenda now as well. Aim to spend 5 minutes speaking one on one with the exhibitor. Of course if no-one is waiting you have more time but be considerate and respectful to the exhibitors and others around you if there are large queues. Remember there will be waiting time (up to 30 minutes) to speak to exhibitors so you too will need to keep moving to get around to your top 20. Complete the forms/registrations. Often companies will have somewhere to log your details. Take a pen and take time to complete any information the company has. This may lead to a response down the track or an invite to another graduate event that company/university may host. After the event. Once you have gained all the information – and there will be a mountain go home, grab a Lever Arch File, sort through and file the information. Then develop an action plan, who you will call, apply to and when. If you think you will do it all in one hit, you will more than likely get overwhelmed. Make sure you know of any key dates (eg/ when graduate applications close) and then develop a schedule of follow up actions to take and when. Good luck. Don’t let the crowds put you off. Find the companies, find the key people and start to charter your career path. It is well worth it! Harvest Human Resources offers Careers Workshops and Resume Writing Services. For further information to steer your career, go to our “Talk to Us” page of our website to register.